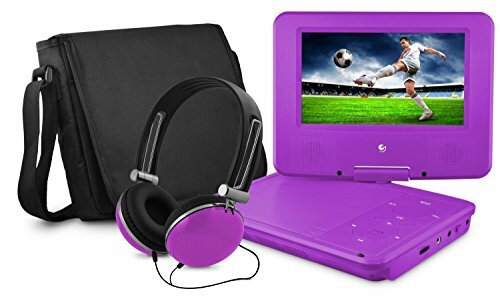 The Ematic EPD707 7" Portable DVD Player with Matching Headphones and Bag makes it easy to enjoy your favorite movies, videos, music and pictures on the go. The 7" screen tilts and swivels to provide an optimum-viewing angle. Enjoy crystal clear audio thanks to the included headphones. The matching bag protects the DVD player while traveling and provides additional storage. 7" 480 x 234 LCD screen. 180 Degree screen tilt and swivel. Built-in stereo speaker. Multi-language on screen display. Supports PAL or NTSC. Built-in rechargeable battery. Frequency response: 20Hz to 20KHz. Video output: 1Vp-p/75 Ohm, unbalanced. Audio output: 1.4Vrma/10kOhm. Audio S/N: 80dB. Power source: DC 9 - 12V. Operating temperature: 32-104 Degree F. Includes 7" portable DVD player, AC/DC power adapter, carrying bag, headphones, user manual. If you have any questions about this product by Ematic, contact us by completing and submitting the form below. If you are looking for a specif part number, please include it with your message.